Our August dish of the month is our delicious parmesan, pancetta and spinach stuffed chicken. This dish is ideal for those late sunny nights gathered around with your friends and family. It is one of our stress-free dinner party favourites, just pop them in the oven and relax. This chicken dish is stuffed with pancetta, two types of cheeses and much more. It will certainly impress your friends and trick them into thinking you have a secret chef hiding in the kitchen! The fillings will add that extra bit of moisture to the chicken and with the crisp pancetta it will give you a variety of textures but ones which you won’t be able to resist. This dish is also gluten free, therefore, you won’t have to worry about different guest’s dietary needs. 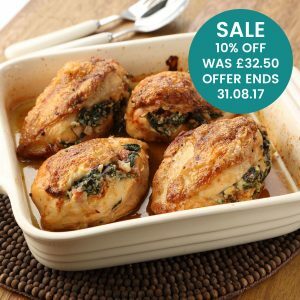 As it is our dish of the month, we would like to give you 10% off until 31st August 2017. In addition to this great offer, we have our free delivery offer in conjunction with this offer. So even more savings for you! Our free delivery ends on 31st August 2017, so remember to buy your dishes now, before you’re too late! For our full range of dishes, click here to see what else takes your fancy.